When it comes to Christmas parties, the idea is fun and nothing is more fun than an ugly sweater party. At these parties guests are required to either makeor find the tackiest Christmas sweater that they can to wear. It is hilarious to see the tacky sweaters that walk through the door. If you are thinking of hosting an ugly sweater party I have some ideas to help make the night even more fun. From food to invitations to ugly sweater party favors, this is a party you can really go all out in if you want. When you are making your party invitations, you should find a creative way to let guests know what kind of Christmas party it is. If you or someone you know knows how to stitch a sampler, you can stitch party invitations so that they look like a sweater. If you do not have any knitting and sewing skills, you can go on a website for eVites. Most of these sites have invitations for tacky sweater parties. These are not only free, they are also a fun way to let guests know exactly what the theme is. Taking a photo with your phone or digital camera of each guest wearing their tacky sweater as they walk in is a good idea. You can dedicate a wall in your home to hanging these picture that you print out. Give each photo a number. After all of the guests have arrived, you can have each person vote for the tackiest sweater. To make this more fun, wrap a box in a tacky sweater. Cut a hole in the top of the box and put the neck hole over the hole that you cut so that guests have access to the box. This is a great way to collect votes from all of the party guests. At the end of the night, you can count the votes, and the person with the most votes wins a prize. If you want to give your guests a great photo to take home as a party favor, setting up a photo booth is an excellent idea. The booth is pretty simple to make. First, you will need a very large piece of cardboard. A box from a refrigerator or a big screen television will work well. If you have a jigsaw, you can use a piece of plywood. You want to cut two squares into the cardboard or the plywood. Make one square higher than the other and make them large enough for a person’s entire head to be seen. Next, find the tackiest wallpaper that you can find and cover the cardboard or plywood with it. You can decorate your photo booth with garland, stockings, and Christmas balls. Creating a name plate saying “Ugliest Christmas Sweater Party” and the date is also an excellent idea. Guests can stand behind the booth and stick their heads through the square holes for photos. These photos make great keepsakes for guests. When it comes to food for your big event, making cookies in the shapes of sweaters, and decorating them as tacky as possible is a fun idea. Each cookie will be different and each cookie will be tackier than the next. If you cannot find a sweater shaped cookie cutter, you can also bake gingerbread men and decorate them wearing an ugly sweater. Each gingerbread man can look different. If you have children, this is something that they can do to help prepare for the party and will have a great time doing it. Baking a tacky sweater cake is also an excellent idea. It is not as difficult as it sounds. A sheet cake and two loaf cakes will make the perfect shape for your ugly sweater cake. Next, decorate the cake as tacky as you can. Your guests will be amused and amazed at your creativity. Using an ugly afghan is an excellent way to cover the table where you are keeping the food for the guests. If you cannot make one on your own, you can ask a friend or go online and find the tackiest afghan that you can find. If you are planning party games, decorating miniature sweaters is a great idea. The first thing that you need are solid color sweaters made for dogs and cats. These can be found in pet stores and department stores. Next, head over to a craft store. You can purchase different colored pieces of felt, pom-poms, glitter, rhinestones, and glue. If you have enough wine bottles for each guest, you can put the sweater over the wine bottle for easy decorating. Let your guests make their sweaters as tacky as possible. After everyone has finished, each guest can vote on whose sweater they think is the tackiest. The person with the most votes can win a prize. If you are using wine bottles, you can allow each guest to take home their wine bottle wearing the sweater as a party favor. They will have a nice bottle of wine, as well as a fun memory of making their sweater. If you really want to go all out you can even dress your dog or cat up in a tacky sweater. Guests will be amused when they see your tacky pet making his rounds during the party. 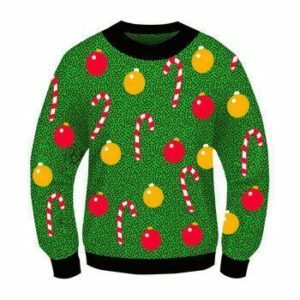 While the tacky sweater worn by guests is the most important part of the party, it is important to make the tacky sweaters the theme of the party as well. Before the guests leave, it is fun to take a group shot of everyone in their ugly sweaters. When you have your party next year, you can hang a blown up copy of the group photo from the year before. This is fun for guests to look at when they arrive at the party. If you make these parties and annual event, you can have many photos hanging up for guests to enjoy. Need some diy party favors. This video will show you how to make ugly sweater charms on the Rainbow Loom! Get your kids to help you with this one. There is more than just tacky sweaters to an ugly Christmas sweater party. The more creative you are, the more fun your guests are going to have. Hopefully these ideas will help you to have the best party on the block!